I haven’t been cooking much lately. After the buzz of the holidays faded, I got hit with a severe cold and just didn’t have much energy for anything. All I wanted to do was lounge out in my pajamas and get under the covers with a good book or movie. Take out, juice cleanses, canned soups and anything low effort was at the top of my list for dinner, besides, I was still feeling a little guilty about all the rich foods I had eaten weeks prior. Then came the bitter cold of last weeks Polar Vortex and knew I’d spend several days indoors. I decided to make a pot of chili last week that brought me back to life and next up was this spicy chicken noodle soup recipe! There’s just something about having a hot bowl of homemade stew or soup that takes the chill out of your bones and makes you feel all warm and cozy inside. This recipe is quick and easy and pretty straight forward. It’s definitely something you can knock out after a long day at work or the weekend. This isn’t your typical American style chicken noodle soup but one with roots in Caribbean and umm Asia! Cumin, oregano, achiote (annatto) and garlic flavors with Asian rice noodles and Thai peppers! A mash up of sorts, part Dominican, part Asian, I call it Dominicasian cuisine! The flavors are all Latin though but with a couple of Asian ingredients because well, it’s what I had and sometimes you just work with what you got! Any kind of noodles would work here, its all a matter of what you like. I would have used egg noodles or fideos (Spanish for noodles, usually very thin) if I had any. Note: If you can’t find Adobo with cumin, use regular adobo and add 1/2 tsp of cumin. Also, recipe includes cilantro which I forgot to add when I made this. Cilantro will really brighten flavor up so be sure to add. Heat up canola oil in a large pot over medium heat. Add onions and cook until translucent. Add the garlic and stir. Add the water, chicken bouillon, carrots, and the rest of the ingredients except the noodles. Let the soup come to a boil. Add the noodles and cook for another 7 minutes until noodles are tender. Lower the heat and let simmer then serve. Five spicy soups I’ve been wanting to make and now is the time! The weather here has been a little strange which has become the norm these days. One day its in the 20’s then it shoots up to 60 then back down to the 30s! Who can dress for this weather? Well one thing is for sure, Winter is here to stay for a while so stock up on your veggies and spices and let’s take a world soup journey. First up is an American nod to Mexico, then a tour of Asia and finally a pit stop in the sunny Caribbean…we can dream can’ t we? So get comfy in your over-sized sweater and thick wool socks and curl up to these awesome spicy soup recipes. 1. 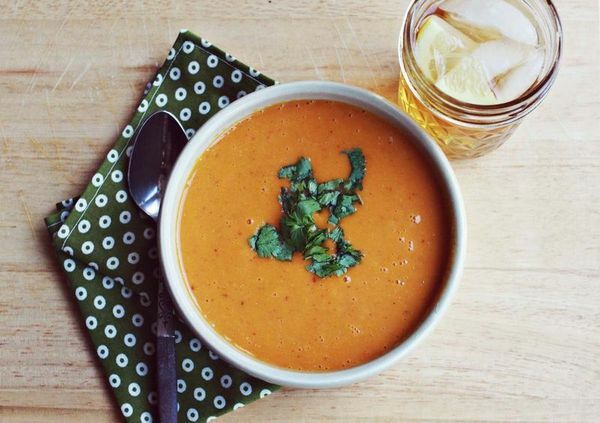 Spicy Chipotle Sweet Potato Soup from A Beautiful Mess. I can just taste the silky smooth sweet potato balanced with the spicy, smokey chipotle and looks so easy to make! 2. 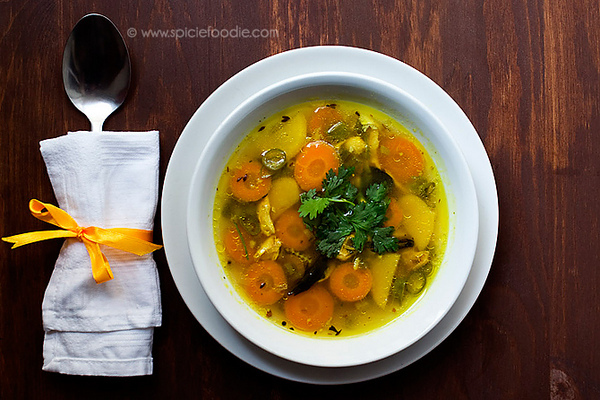 Indian Spiced Chicken Turmeric Soup from Spicie Foodie. I love Indian spice flavors and this soup is healthy and good for you. Studies show that turmeric has cancer fighting properties so get your fill here. 3. Yunnan Beef Stew from Lady and Pups. 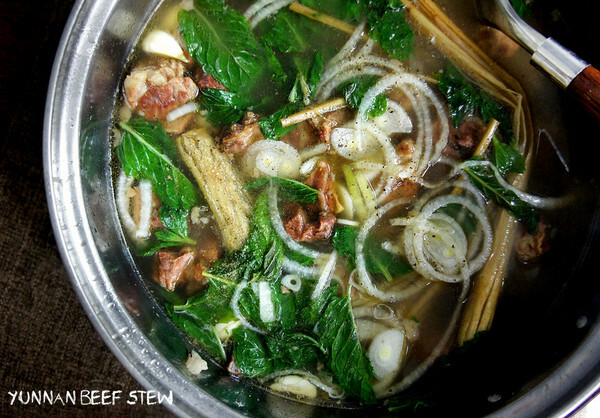 Just look at it, how can you resist this delicious bowl of short ribs, ginger, garlic, lemongrass and mint? Soul soothing! 4. 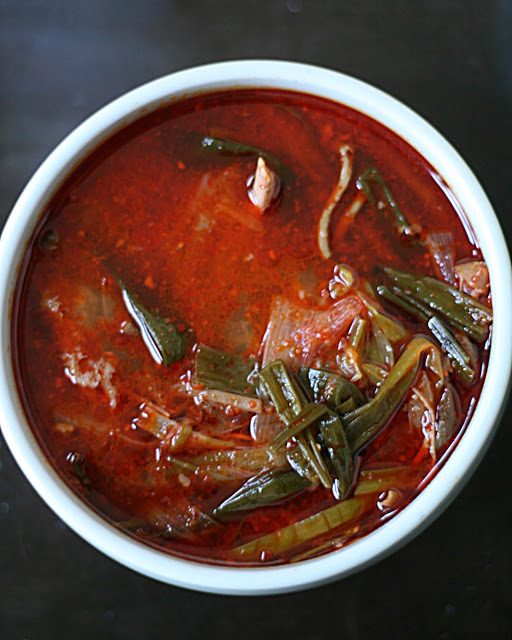 Korean Spicy Green Onion Beef Soup, Yuk Gae Jahng from Week of Menus. This is my go to soup when ever I go to little Korea in NYC. This soup is peppery, bold and heart warming. 5. 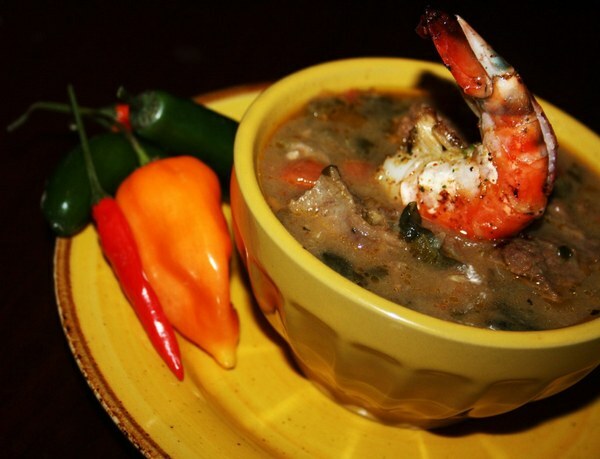 Jamaican Pepper Pot Stew from My Wooden Spoons. This soup is gorgeous and just waiting to be devoured! Add a scotch bonnet pepper to the pot for extra heat! One of the things that always comforts me on a cold, rainy day is a hearty soup. 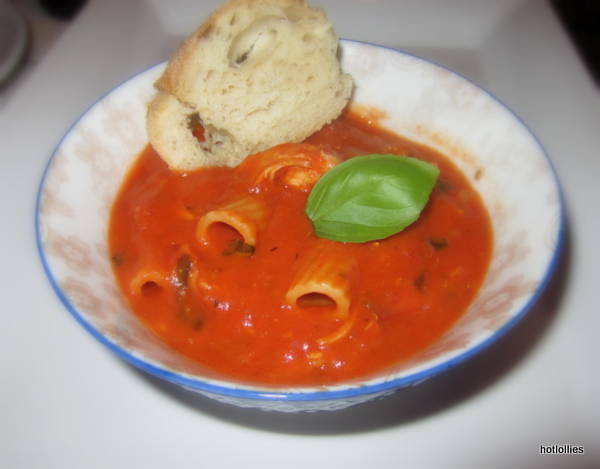 It was pouring out this past Sunday and chilly in the 40’s so soup was perfect for dinner and decided on this creamy tomato soup with chicken and pasta. I was inspired by the chicken tomato soup with orzo served at Hale & Hearty, a popular soups and salads chain in NYC area. I order that soup every time I go there! It’s so good but sometimes just don’t feel like dishing out $7 for an itty bitty cup of soup so made a whole pot of it, enough for 6 servings! I’ve had it twice already and still have lots more, which I froze, and all for hmm, let’s see, about the same price! I of course didn’t have the recipe but thought I’d try to make something similar. I also made it spicy and it was perfect! I used rigatoni pasta because that’s what I had on hand but this soup would pretty much work with any pasta, just as long as you don’t use too much. Even lasagna would work if you break it up into pieces. 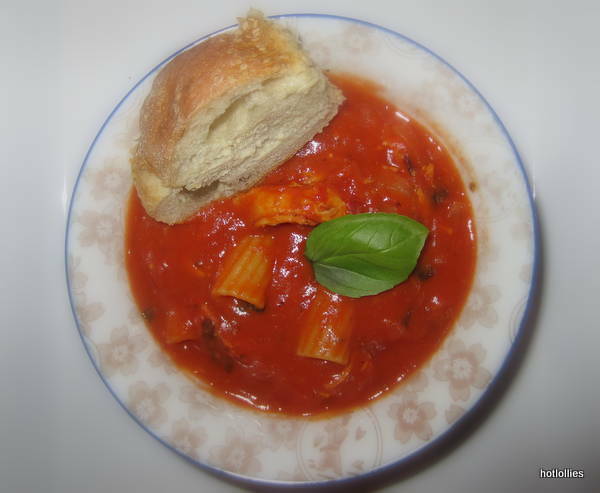 The soup should be nice and thick, not too runny and the focus should be the tomatoes, so less pasta is better. I also had to make it a little spicy which the chain’s version is not but it’s exactly what I needed. The rain pounding on the windows outside, the chill indoors (because I refused to turn on the heat!!) and the hot, spicy soup was so nice and delicious. I’ve also been fighting off allergies for a while now and soup just always does the trick in helping me feel better and clearing up the sinuses. Give this one a try and let me know what you think. I haven’t made too many soups this year because the weather has been so odd here. We had temperatures in the 70s in January, last week it reached 80 then plunged into the 40s…really freaky but you know, I adjust. Next time I’ll make pozole, which I’ve been putting off…that recipe is a bit daunting but I’ll do it, I’m determined! Next is a chicken tortilla soup for Cinco de Mayo so stay tuned! 1. Season a pot of water with salt, to taste, and bring to boil. Add the chicken until its completely cooked through.When chicken is done, shred it with a fork. 2. In a separate large pot heat up the oil on medium heat, add the onions and cook until translucent. Add the garlic and stir, then add the shredded chicken. Next add both cans of tomatoes, the chicken broth, and the cream and stir well. As mixture is coming to boil add the herbs, salt, hot sauces and pasta. Stir well and let soup cook for 10-15 minutes until the pasta is very tender. 3. Serve with crusty Italian bread and sprinkle with a bit of grated parmesan cheese if you like.